I've got a new recipe for you today. It's for Easy Breakfast Bites! They are nutritious, filling and most important...delicious! They are a cross between a mini quiche and a savory muffin (more muffin-ish) and contain all your breakfast favorites packed into a single little bite sized gem; eggs, bacon, and cheese. The almond flour helps gives them their bread-like texture. The kiddos will love these, too. 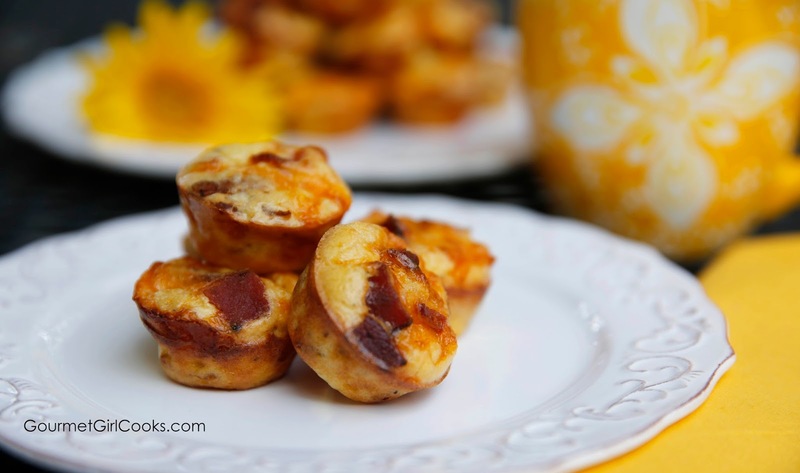 They make a perfect portable breakfast to pack and take along with you to eat in the car or on the run and can easily be made ahead of time. You can switch them up and make them your own by substituting sausage for bacon, or toss in some diced sauteed peppers and onions, add different cheeses, or whatever your little heart desires. I love these little bites and plan to start taking them with me to work so I can take a break from my daily yogurt for breakfast. They are ridiculously easy to make. I love them and hope you do too. Check out the photos and recipe below. Enjoy! 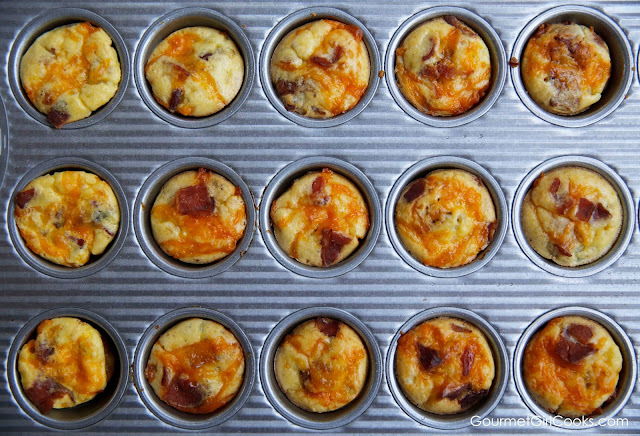 Preheat oven to 350 degrees F. Lightly spray or grease a 24 cup mini muffin pan with olive oil or coconut oil spray; set aside. Combine eggs, cottage cheese and cream in a 4-cup glass measuring cup or medium size mixing bowl. Add almond flour, Parmesan, and salt and pepper, to taste; whisk together until blended. 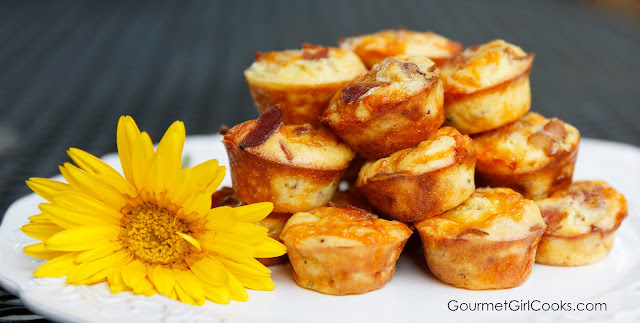 Divide cheddar cheese evenly between mini-muffin cups. Divide crumbled bacon evenly and add on top of cheese. Pour or spoon batter mixture evenly among muffin cups. Top with a pinch of additional cheese, if desired. Bake for 18 to 20 minutes or until golden brown and puffed. Makes 2 dozen. 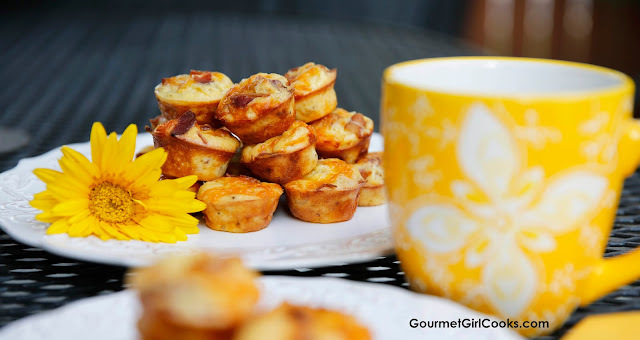 *Note: Using a glass measuring cup instead of a bowl to mix batter helps make it easy and neat to pour egg mixture into mini muffin cups. These look great!!! What would you consider as a serving -- how many. Do you have carb counts on these. Can't wait to try them. Thanks for all your hard work. Oh, wow, these would be perfect for DH & me when we travel on the road. All we need is a mug of coffee to go with these. Going to make & try these tomorrow morning & see if we like these (bet we do!!) Will let you know what we think of these. Not only will we use these on the road, but they look like we can take these along on those days where we have to wait for a car repair (the dealer does provide coffee, but also unhealthy donuts as well...a big no-no for us). Hi GG, these sound delicious! Do you think they would freeze (properly stored, of course)? I hope you and your husband enjoy these! I finished up a batch this week and will be making up another soon. They came in handy once last week when I didn't have much time for lunch...I just grabbed a few of these along with some rolled up turkey breast. Do you happen to have a substitute for cottage cheese? You could try using ricotta cheese or sour cream; both should work. Thanks. Hi, what about substituting freshly grated Parmesan for the powdery stuff? I tried it with sour cream and they were so good. My whole family loved them, even my picky kids. 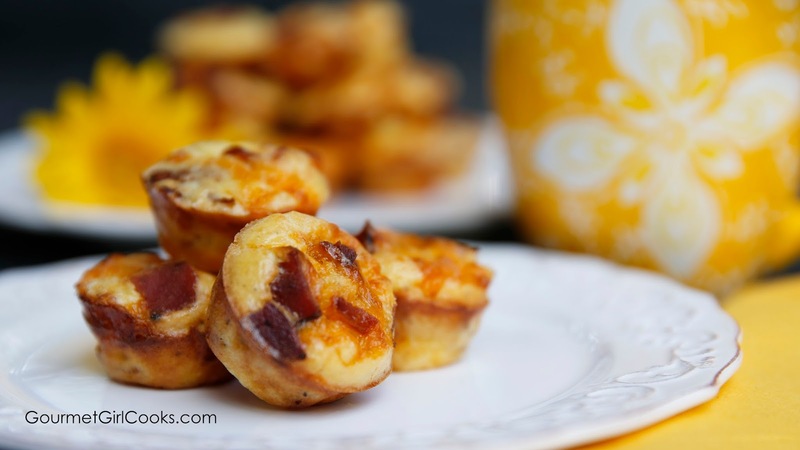 I am going to try to make them with sausage or with ham next :) these will become a regular in our house. Made these last week, & they were great. Going to tweak them a bit by cutting down to 4 slices of bacon instead of 8. Since being on WB, my taste has changed a lot, & one of them is with salt. It's very noticeable to me now, in just about everything, so have to cut way back on it. (Might be the brand of bacon used as well, which was a nitrite free one). All in all these were very good. Might make other changes in the ingredients as well since this recipe is very adaptable. The 3rd time they were eaten, I sliced 3 of these in half, then spread a small amount of cream cheese on the halves. That was a very tasty to go with. Btw: will be changing the method of making these a bit too. Used small curd cottage cheese & found out that it likes to sink to the bottom of the measuring cup; that can be solved by stirring it a bit before pouring the mixture into the mini muffin cup. The recipe didn't mention to use the large or small curd cottage cheese, so not quite sure if that made a difference or not. Thank You for this recipe. It's a keeper.